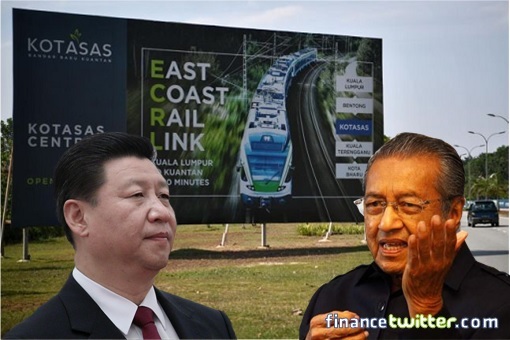 The on-again, off-again East Coast Rail Link (ECRL) project is still being studied whether to be dropped or deferred, some 9 months after the new Pakatan Harapan government defeated the Barisan Nasional regime. Just when everyone thought a final decision is about to be announced, Prime Minister Mahathir Mohamad dropped a bombshell – no decision has been made. The decision was arrived as Mahathir’s two top guns – Finance Minister Lim Guan Eng and Economic Affairs Minister Azmin Ali – contradicted each other. Days ago (Jan 26), Mr. Azmin announced that the Cabinet decided to cancel the US$20 billion (£15.2 billion; RM81.9 billion) ECRL project because the country could not afford the RM500 million annual interest payment. 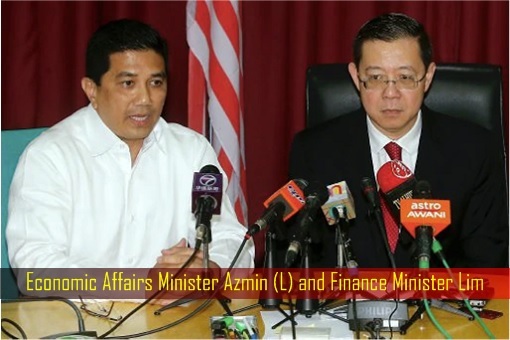 Amusingly, later on the same day, Mr. Lim expressed his shock over Azmin’s announcement, saying that his colleague was not at the Cabinet meeting that made the decision, suggesting that the Economic Affairs Minister was trying to take cheap credit unnecessarily – even trying to undermine the Finance Minister’s jurisdiction, or leaking top secret strategy. When Mahathir came back from overseas, he defended both ministers – “What happened was that both are right, but the timing was wrong.” But was Azmin really that ignorant when he “accidentally” revealed the confirmation that Malaysia’s contract with China Communications Construction Company (CCCC), signed under the previous Najib regime, had been annulled? When Najib announced his pet project ECRL, it was announced that it would cost taxpayers RM55 billion for the entire 688-km line. The nightmare started after the crook lost the 14th general election on May 9th. After the Pakatan Harapan took over the government, it discovered that the final cost of the ECRL project is actually a staggering US$20 billion (RM81.9 billion). Back in 2016, the Sarawak Report exposed Najib’s dirty secret deal with China to pay off 1MDB massive debts, jacking up the ECRL project cost by a whopping RM30 billion of taxpayers’ money to bail out the Ponzi scheme – 1Malaysia Development Berhad (1MDB). The meeting minutes published by the WSJ (Wall Street Journal) recently confirms the hanky-panky deal. 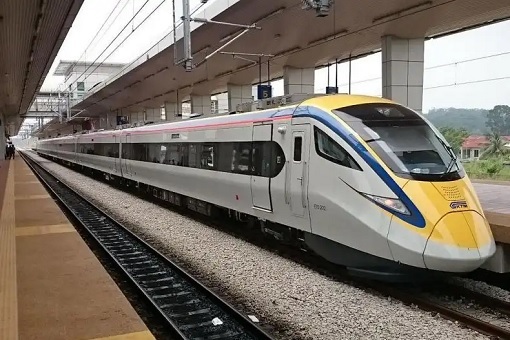 First option – the Cabinet could not agree with the ECRL cancellation as RM20 billion on the project cost has already been paid, being the payment for 20% of the phase one of the ECRL project, therefore, it doesn’t really make sense to just scrap it. Interestingly, in Oct, 2018, Finance Minister Lim claimed that the Government will be able to recover RM10 billion from the RM20 billion paid. However, according to documents sighted by “The Malaysian Insight”, the new Pakatan Harapan government will have to pay a whopping RM22 billion in compensation and penalty charges if the project cancellation is triggered. So, assuming Beijing is willing to pay back the RM10 billion to Kuala Lumpur, the controversial project would still burn a huge RM32 billion of taxpayers’ money, with no ECRL at sight. Still, it would be better than burning RM81.9 billion on a project which ultimately would become a white elephant, thanks to former PM Najib Razak. That was why the 93-year-old Mahathir whined, moaned and bitched that Malaysia will be “impoverished” if the government proceeds with the wasteful and useless project. So, the second option is to cancel the ECRL project. After launching the National Anti-Corruption Plan three days ago (Jan 29), the premier also said – “The huge compensation for cancelling it is not as huge as the amount we have to carry for the next 30 years.” But if Mahathir is adamant about scrapping the ECRL project, they could make the announcement 9 months ago, pay the RM22 billion penalties and move on. The fact that the government is pussyfooting and beating around the bush suggest there could be a third option – the Mahathir administration is playing “Tai Chi” with Beijing. China knew Mahathir isn’t as pro-China as his predecessor Najib. 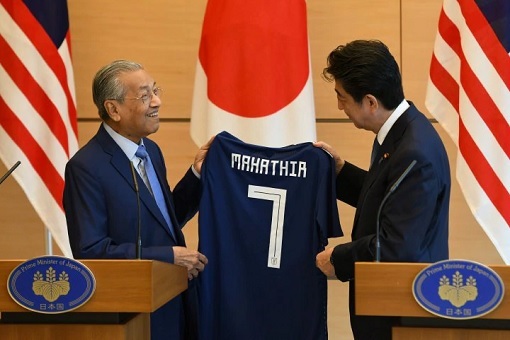 And there’s no guarantee that Malaysia would not approach Japan immediately to continue the ECRL project once all the Chinese contractors are booted. There have been reports that the government is looking for a new contractor after terminating the contract awarded to China Communication Construction Company Ltd. So, the Chinese contractor had offered to cut the construction costs – as much as 50% discount – to force Malaysia’s hand. Indeed, it was a clever move to force a re-negotiation and to push Japan against the wall. If China could not get the project even at 50% discount, it would make sure Made-in-Japan trains can not come to the country. To pacify the Malaysian government, the Chinese embassy deliberately composed a song – “The Left Shoulder” – to commemorate the 45th anniversary of the establishment of Malaysia-China diplomatic relations. 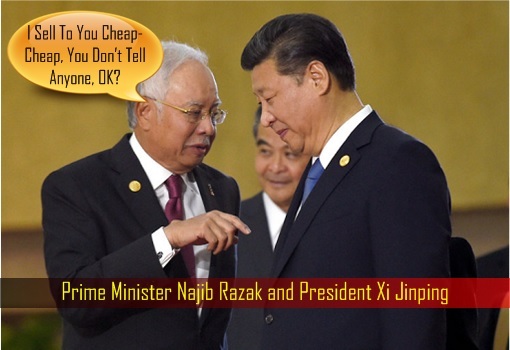 The unbelievable steep discount offered shows that not only Najib had conspired with CCCC to rip-off the people of Malaysia, but also the importance of the ECRL project to the Chinese’s OBOR initiative. This also means Beijing will not walk away happily, even if Kuala Lumpur willingly pays the RM22 billion penalties. Beijing may retaliate by stopping to buy palm oil from the country, making life tougher for Mahathir. Hence, the sudden instruction within the Mahathir government to stop issuing any statement with regards to the ECRL project. As the Chinese contractor throws everything, including the kitchen sink to stop the termination of the project, the government’s new challenge is how to do it diplomatically. It didn’t help the situation that the opposition keeps pouring fuel to the fire about offending Beijing if the deal is off.